Insomnia is associated with difficulty in initiating sleep, maintaining sleep, and/or achieving restorative sleep (McCall 2004). 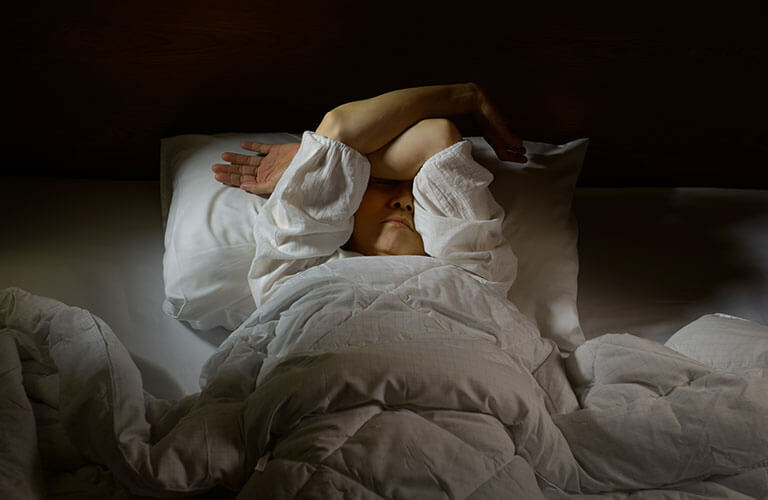 Difficulty in getting to sleep, waking in the middle of the night, and waking early have been reported as the main types of sleep disturbance experienced by tinnitus sufferers (Hallam et al. 1988). It is important to explore the mechanisms underlying the association between tinnitus loudness and sleep disturbances. Tinnitus loudness is a primary attribute of tinnitus, but it is not clear whether the degree of insomnia is directly related to tinnitus loudness or whether the degree of insomnia is related to psychological factors such as annoyance or depressed mood. This can be assessed via mediation analysis (Bollen 1987). 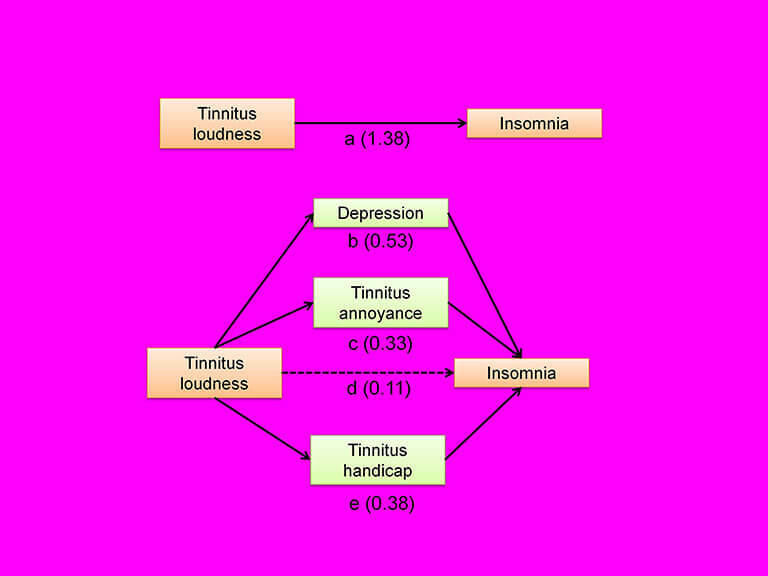 The aim of mediation analysis is to assess the direct and indirect effects of tinnitus loudness on insomnia. This is achieved by determining whether the relationship between tinnitus loudness and insomnia changes when other variables are included in the analysis. If the other variables do change this relationship, and if they are themselves related to the dependent variable, they are known as mediator variables (Baron & Kennedy 1986). 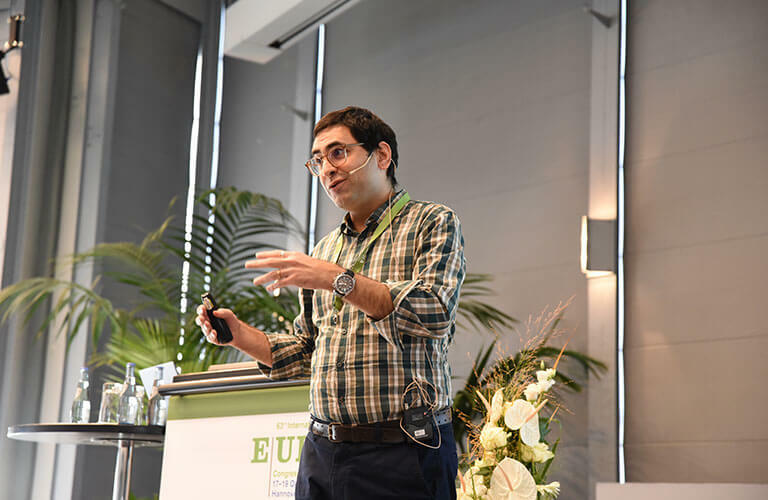 Dr. Aazh’s tinnitus team studied whether there was a relationship between self-reported tinnitus loudness and insomnia and factors mediating any such relationship. 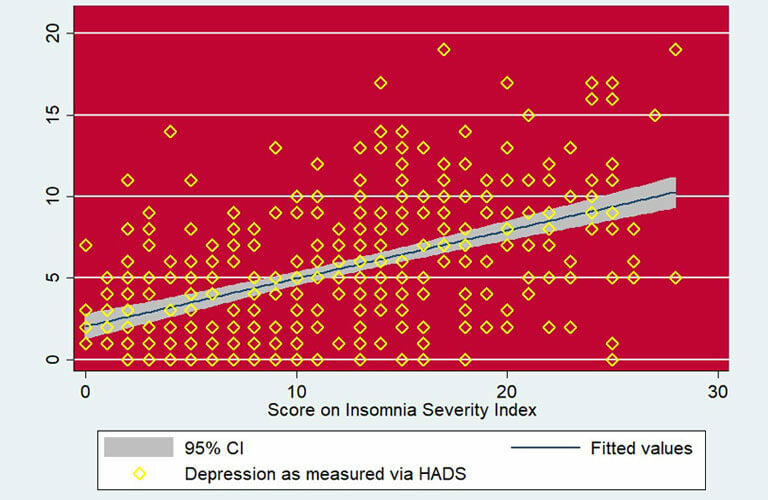 An analysis using data for over 400 patients showed a statistically significant relationship between tinnitus loudness and insomnia (path “a” in Figure 1). The numbers in the diagram refer to the strength of the relationship. The outcomes of the mediation analysis are summarized in lower part of the Figure 1. The mediation analysis showed that the relationship between tinnitus loudness and insomnia was fully mediated via depression, tinnitus handicap, and tinnitus annoyance. In other words, there was no direct effect of tinnitus loudness on insomnia. Rather, it may be the case that greater tinnitus loudness is associated with increased depression, tinnitus annoyance and tinnitus handicap, and that these in turn lead to insomnia. One clinical implication of this finding is that, for patients who suffer from tinnitus, insomnia may be alleviated if tinnitus annoyance, tinnitus handicap and tinnitus-induced depression are managed adequately, even if the tinnitus loudness remains unchanged. Past research has shown that although various forms of tinnitus rehabilitation only minimally reduced the loudness of tinnitus, the handicap and annoyance produced by the tinnitus and depressive symptoms typically improved considerably (Aazh et al. 2008; Aazh & Moore 2016; Martinez-Devesa et al. 2010). Hence, such rehabilitation is likely to reduce problems with insomnia. A common concern expressed by patients is that although they can cope with the current loudness of their tinnitus, their biggest fear is that if their tinnitus gets louder it may prevent them from sleeping at nights, leading to a constant state of fatigue that they would not be able to cope with. It may be helpful to such patients to inform them about the outcome of this study. They can be reassured that, although there is no proven method to decrease the loudness of tinnitus, rehabilitative procedures can reduce the impact of tinnitus on their life and decrease their emotional reaction to the tinnitus, thereby reducing the impact of tinnitus on their ability to sleep. Aazh, H., & Moore, B. C. J. (2016). A comparison between tinnitus retraining therapy and a simplified version in treatment of tinnitus in adults. Auditory and Vestibular Research, 25, 14-23. Aazh, H., Moore, B. C. J., & Glasberg, B. R. (2008). Simplified form of tinnitus retraining therapy in adults: a retrospective study. BMC Ear Nose Throat Disord, 8, 1-7. Baron, R. M., & Kennedy, D. A. (1986). The moderator-mediator variable distinction in social psychological research: Conceptual, strategic, and statistical considerations. Journal of Personality and Social Psychology 51, 1173-1182. Bollen, K. A. (1987). Total, direct and indirect effects in structural equation models. Sociologoical Methodology 17, 37-69. Martinez-Devesa, P., Perera, R., Theodoulou, M., et al. (2010). Cognitive behavioural therapy for tinnitus. Cochrane Database Syst Rev, 8, Cd005233.